Steve Gingold recently showed some Massachusetts waterfall photographs, so I thought I’d follow suit. What made that possible down here in Austin was the cooperation of nature on the night of December 26th, which gave us several hours of lightning and thunder plus the 3 2/3 inches of rain that fell onto my part of town. The next morning, eager to see what effect the rain had had, I went straight to one of the two good waterfalls I know in this area, the one on a tributary of Bull Creek along Spicewood Springs Rd. near the Capital of Texas Highway. The resulting photographs differed from a couple of others I’ve shown of this place over the years because the sky had completely cleared and the sun was high enough to cast tree shadows on the waterfall. Isolated froth at the base of the falls off to the right undulated somewhat with the flowing water, but not so much that I didn’t try taking half a dozen pictures of it with the camera set at the same 1/1250 of a second shutter speed I’d used to stop the action in the first photograph. Even with a high ISO of 2000, such a quick shutter speed required a broad aperture of f/4, so to maximize what I could get in focus I leaned over and aimed straight down. What I didn’t realize while still at the waterfall is that aiming vertically created in the bubbles a lot of little images of me with my upraised camera. 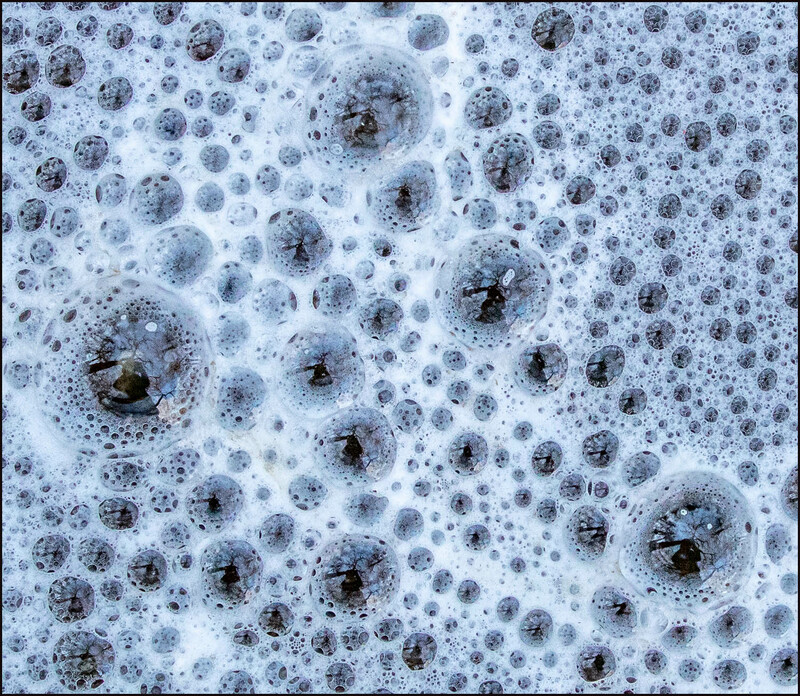 If you’d care for a much closer look at the bubbles and my inadvertent self-portraits, you’re welcome to click below. Then I’d say we’re like you. During the summer and even into the fall it’s not unusual for this creek to run as a trickle or not at all. Because of that, when we get significant rain in the autumn I check out this waterfall. You can see I wasn’t disappointed this time. The image of the waterfall is fantastic, with the texture of the leaves continued into that of the falls. There is something profound in your multiple selfies, I’m not sure what, but something! As for the multiple selfies, I’d say they’re more found than profound. Of course you’re free to go with the latter. Wow. That’s amazing. Great work. It’s a great waterfall when the creek flows at this volume. Because the falls aren’t quite visible from the road, I suspect many people don’t know they’re there. Beautiful! And highly original ‘selfies’ in the bubbles. I very much prefer the faster shutter speed to suggest the action rather than the ubiquitous silky smooth look that seems to be the fashion. We’ve had some rain to create waterfalls in the hills, but far less than normal. It’s not the first time I’ve ended up with inadvertent selfies; I was so intent on photographing these bubbles that I forgot about the reflections till I saw them on the computer screen later. I’ve dabbled a bit with the silky look that, as you say, is fashionable. On the whole, though, I favor the stop-action look I’ve shown here, and which characterized most of the pictures I took of these falls. Too bad your falls are suffering from less-than-normal rain. I hope the precipitation picks up, as ours did. Multiple tiny images of you. Lovely waterfall image, but the bubbles are even better. I know those inadvertent selfies all too well from drop photographs I’ve taken. I know what you mean about images in drops. As for the bubbles, I don’t believe I photographed any on my previous visits to this waterfall. There may not have been any calm enough to take pictures of, or I may have been too caught up in taking pictures of the falls. I do like the first photo but the inadvertent selfies are delightful. Never have I been so numerous. What fun to comprise multitudes. Inadvertent is one of those negative words whose positive version we don’t use. No one does something advertently. I might call that statement a claimer, except we only use the negative form disclaimer. What a pity we aren’t more positive towards those words. Of bubbles; this morning the grass was covered with rain drops. The light on the drops was such that it looked as though the whole lawn was covered in glitter. Unfortunately I couldn’t capture the glitter on camera. It was a magical sight. From what you say, you glittered your way into 2019. The magical sight lives on in your memory, if not on your computer screen. 3.67 inches of rain in a single storm? Does that happen often in Austin, or has it started in the last few years? The foaming water seems to be pollution, rather than the effect of vegetable matter in the water. We have a lot of experience with flowing water in Ithaca. Happy New Year, Steve!!! For whatever reason, I don’t recall taking pictures of Lake Cayuga during the half-year I lived in Union Springs. Maybe a return visit’s what’s called for after so many years. Thanks, and an equally productive 2019 to you, too, plus a few more hours to savor in 2018.
make it look pretty similar to the waterfall shown in my post. If I do get back to Union Springs, I’ll have to check it out, along with better-known falls like Taughannock. What a good rain can do! And you know first-hand. You also know how destructive that kind of rain can quickly become in our part of the world. That waterfall is a beauty. You were so smart to race out and catch it after a big rainfall. Reminds me what the spring thaw does to creeks and waterfalls up here. Sometimes there’s not much space between being photo-adept and a photo-addict. The rain came and I felt I had to heed its call. For the sake of photographs, I wouldn’t mind experiencing a spring thaw again, starting with the ice accumulated from the winter just ending. The bubbles do it for me also. I’ve a few images with too many of me in them too. Then we get to say that they contribute to our bubbly personalities. The first photo seems especially delicate to me. The way the sky shows through the various tree branches, and the rock through the falling water, give it a lightness beyond that provided by the sun. 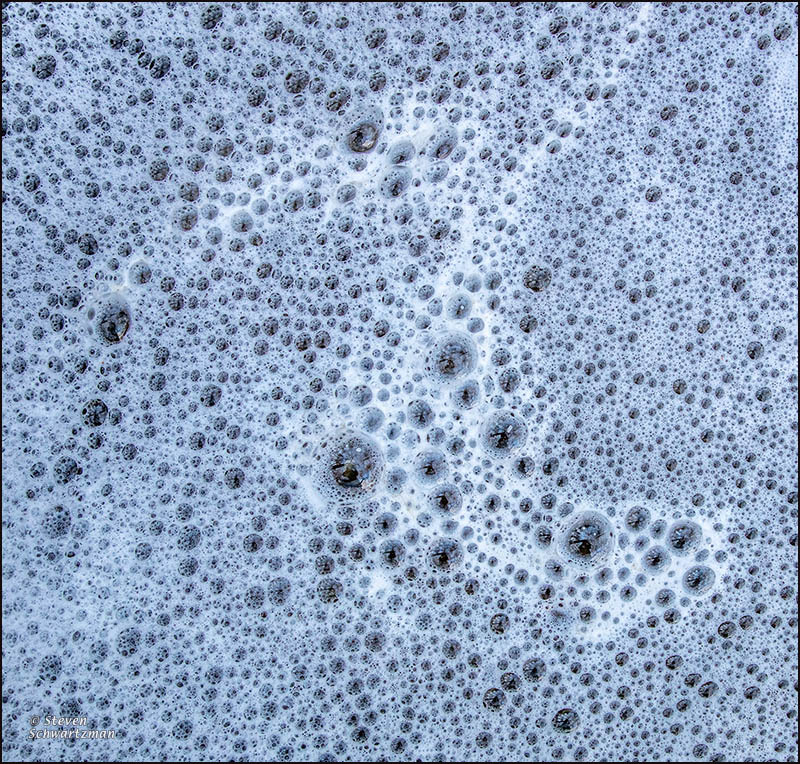 I see an image other than yours in the froth, one that reminds me of petroglyphs and pictographs. The whiter bubbles seem to show a bird with its beak pointed downward and to the left in the upper left hand corner, and its rump in the lower right. Just for fun, there’s one big bubble for its eye, and a couple of upraised wings behind. It’s not hard to imagine it dancing — perhaps in celebration of the new year. 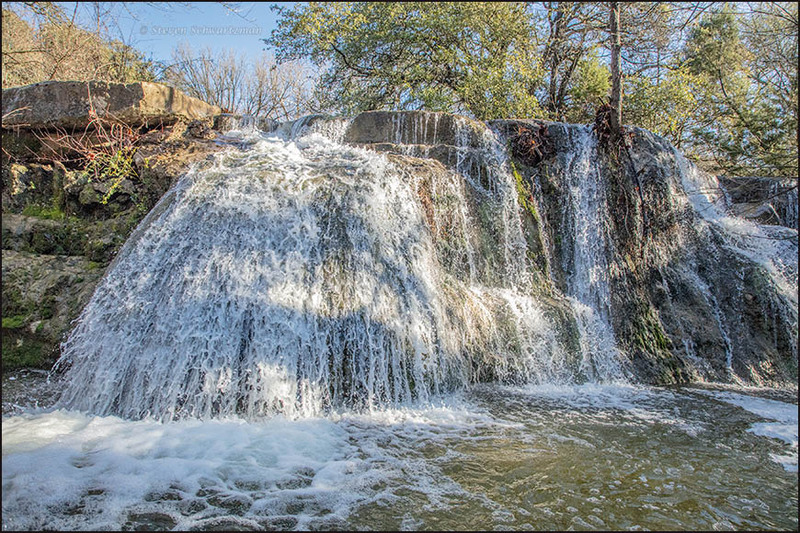 It might be nice if more Austinites knew about this waterfall. On the other hand, then the place would get trashed out and maybe even damaged, so I’ll keep it mostly to myself (and readers who come here). Following your description, I now see your pareidolic big-eyed bird in the whiter foam. Paradoxically, my mind wants it to be a dark bird; what a contrarian imagination. It seems people are becoming reluctant to publicize beautiful spots they discover for just that reason: bringing too many people to the places they enjoy leads to degradation of those very places. I’m sure you’ve come across articles like this one in the past year or so. Even such a simple thing as bank fishing is becoming harder in Texas, as both the state and private property owners deny access because of problems with vandalism and trash. There was a pristine area along Bastrop Bayou where I used to love to walk. It was open to the public for fishing, and beautiful. The last time I was there, the trash was piled high and scattered all along the bank, and there was a distinctly creepy feel to the place. Sometimes, I just don’t understand people. Aside from reading articles like the linked one, in the past few years I’ve experienced those crowds at national parks, including Zion, the Grand Canyon, and Joshua Tree. Not long before your comment, Eve summarized an article she’d just read. Someone in authority, it seems, had the bright idea to remove trash cans from certain national parks to “beautify” them. The predictable result was that those places got trashed out by people who didn’t know what else to do with their garbage. In general, the older I get, the less I understand people. It was exciting, no doubt about it. The shadow effects on the falling water are really nice, and in the category of self-portraits, you win! And you didn’t even need a selfie stick, nor did you have to fall off a cliff. Well done. Any outing on which I keep from falling off a cliff is a successful outing, as far as I’m concerned. I’ve photographed this waterfall several times in recent years but this is the first time I remember shadows like the ones that the trees cast here. Let’s keep the selfie bubbles quiet~the world doesn’t need any encouragement in that field. A little over a year ago I was walking a favorite trail with my son. We peered over the railing of a boardwalk and spotted a water plant I wanted to get a photo of. When I looked at the photo later I saw that I’d caught Jim’s reflection too. That photo delights me. When he was a child we spent a lot of time in the field, although I never really knew whether he liked it or was just resigned to it. Now, though, he will join me or even go out on his own. Yeah, “selfie bubbles” wouldn’t be a such great thing. I’m glad to hear you’ve passed your love of nature along to the next generation—and inadvertently documented it at the same time; I understand why you treasure that photo.